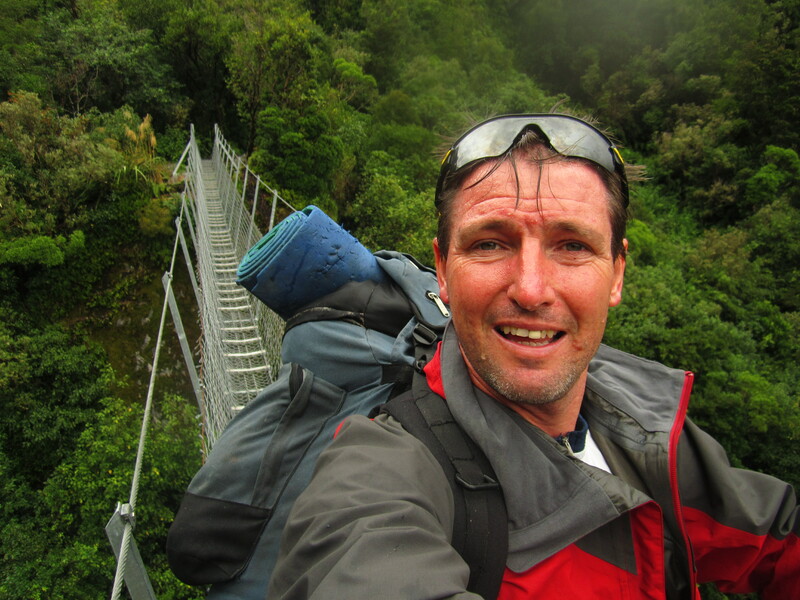 ADAM GLOVER CYCLING LONDON TO NEW ZEALAND. | SOUTH ISLAND LEG. 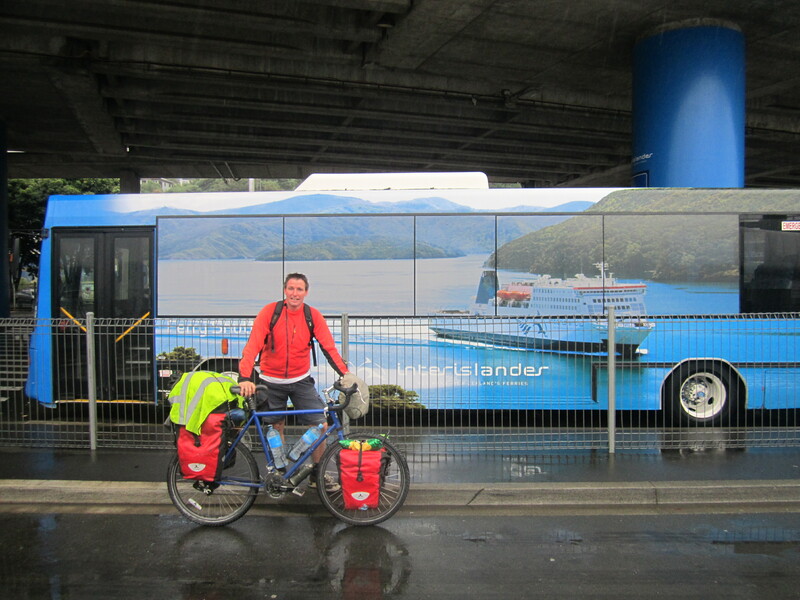 ADAM GLOVER CYCLING LONDON TO NEW ZEALAND. I contacted the two Cook straight Ferry company s and within 30 Mins Liz at the Interislander had kindly come to the party with a free lift to the South Island. I then cheeked if that would extend to a lift back and was happy to hear that wouldn’t be a problem either. After 6 weeks Wellington is having its first day of rain. It just happens to be the day I am heading to the South. At 8am I set off for the ferry terminal in light drizzle fog and mist. 10am I boarded the ferry walking my bike on to the car deck. Shame it wasn’t the best day to be sailing one of the most beautiful ferry journeys in the world. 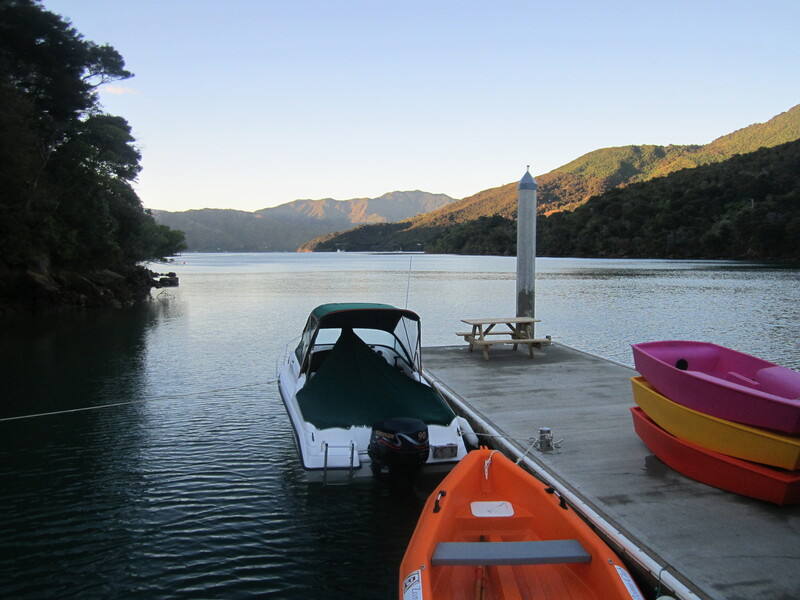 When you enter the Marlborough sounds of the upper South island it is just stunning. Even with the low cloud it was looking pretty good. In Picton I meet my friend Regula from switzerland. Who I meet in China in 2011. She has been living and working in New Zealand and is now driving around for 6 weeks before she heads home. She gave me a bit of a break on day one. We loaded the bike into the car and drove 30km around the hilly and wined road around the sounds to Misaltoe Bay to camp. We got the tent up between showers. It cleared in the evening and the water was dead flat. From the small wharf we could see a number of sting rays swimming in the bay. For dinner we reenacted the meal we shared in China…………not what you would think. After a trip to Carrefour. we spoilt ourselves with cheese, bread, olives, Salami chocolate and red wine. It rained all night and was still raining in the morning. We spent the morning in the kitchen before we set off for a good 3 hour walk up to the lookout. It started off by passing under the cover of the forest as we climbed. The bush then thinned and we could see the beautiful blue water and the little bays with the odd small wharf, the odd batch and the odd sailing boat moored in the sound. When we got to the top it was still a bit wet. We had a 360 degree panoramic view over the sounds. On the way back we D-toured to Te Mania Resort for Coffee and an ice cream. What a beautiful morning. The sun is back. we packed up. Had some avocado on toast for breakfast. Regulia will head to Wellington and I will head towards Nelson. Regulia gave me another break with a lift to Havelock. On the way we stopped at the lookout and we could see snow on the mountains and feel the cold chill. We had coffee in the sun before saying good-bye. 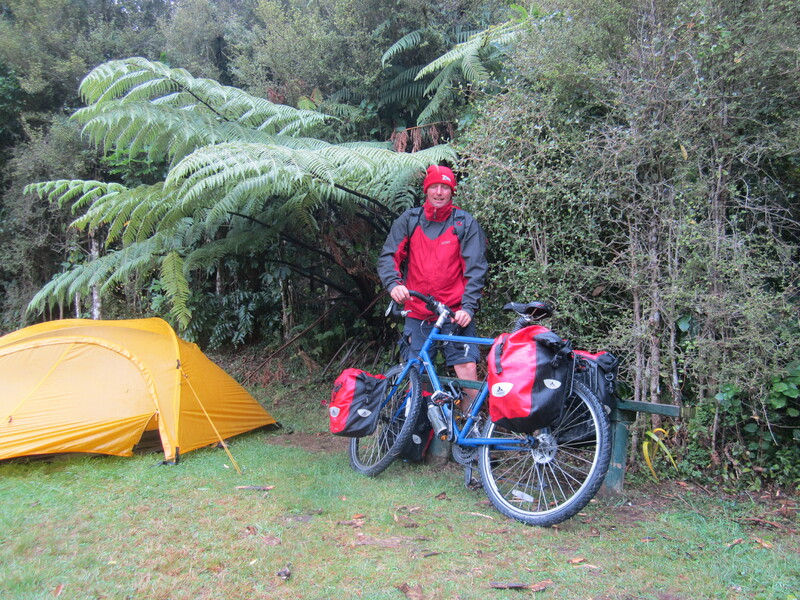 I then cycled a mare 15km to Palours Bridge where I camped for $12 at the very nice Doc camp site. With the good weather I set of straight away for some nice walks. The first was along the river and up too a couple of small water falls. There were some massive 600 – 800 year old native tree’s. Rimu, Tawa and Totara. Pelours Bridge crossing the Pelours river is a nice rout iron single lane bridge. 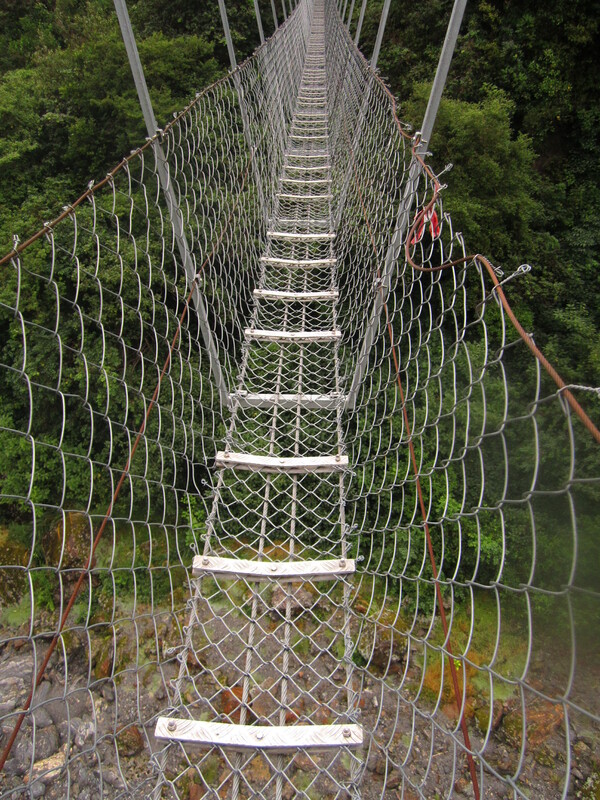 Close by was a 100 meter walking suspension bridge which hung 20 meters in the air and move quite a bit as you crossed it. I guess this is the first real cycling day on the south Island. I cooked up some eggs on toast before setting off about 9:15am. The mornings are cold. I only cycled a few km before I had the first hill to climb. always a good way to warm yourself up on a cold day. I stopped for lunch before the 2nd and more steeper hill. 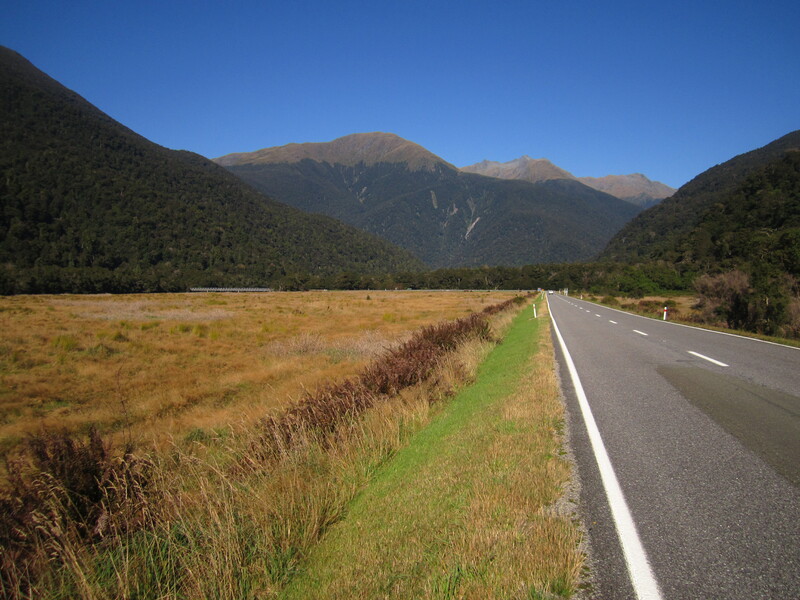 For days I had heard about the big hills on the way to Nelson……….which you then worry about only to find they are not as half as bad as you think. Within hour the second hill was over and then it was all down hill to Nelson. the last few km were along the water. I visited the centre before heading out to visit my friend Aymeric who I know from my days in France and is now living in New Zealand with his new wife Kim. They are staying half way up a hill with great views over the beach. i should really have moved on to-day. Tho I do have plenty of time. I am curious of the fact winter will be here soon and I really need to see as much as I can while the weather is still good.Today was a pearlers of a day for taking it easy. Nelson didn’t disappoint. It’s not the sunshine city of New Zealand for nothing. From Aymeric’s house I walked down the hill to the beached with the tide out walked along the beach for miles. Saturday I am still here. My hosts have been so great. They can’t get rid of me. This morning we all went down to the local market. 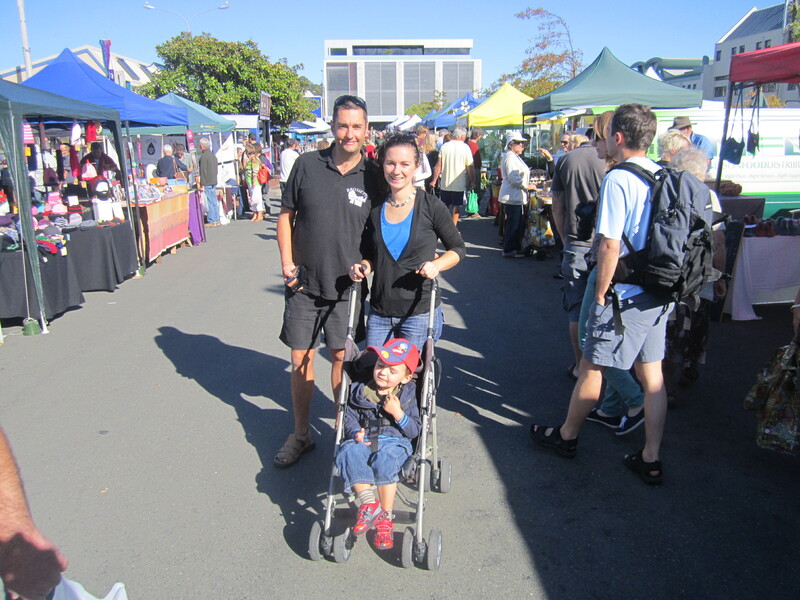 a great little market with a verity vegetables foods and crafts. I stocked up on some fruit and veggie to take south. In the Afternoon Aymeric and kim kindly took me on a nice little drive up past Motueka to Kaiteriteri which is a beautiful bay and where you get the water taxi to take you out to start the Able . We had a picnic lunch on the beach with pies from the french Bakery in Motueka with variety like Camembert and steak, blue cheese and spinach. After lunch we walked around the rocks to the next bay. There was a small cave carved out by the sea. On the way home we stopped for world-famous ice creams. made from fresh fruit. A few drinks on Saturday night was a good enough reason to stay Sunday. After a good sleep in. it was hardly worth leaving. After some lunch We all went out for another nice trip to Rabbit Island. 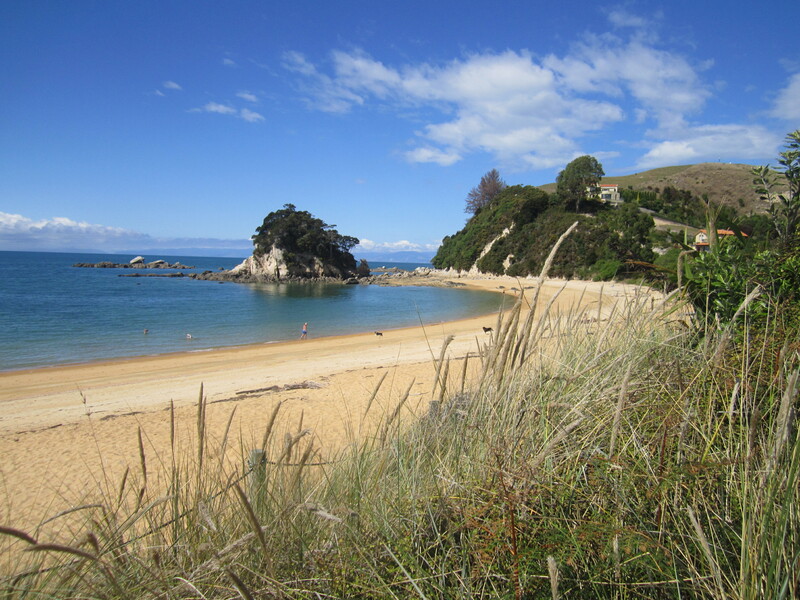 A nature reserve and beach not to far from Nelson. There was not so much drinking and an early night to ensure a successful departure tomorrow. I said good-bye to my friends and joined the morning peak hour traffic heading out of Nelson. I was soon able to join a cycle lane that took me out to Richmond. It was then on the road to Brightwater. Just outside Brightwater i stopped off to visit the Earnest Rutherford memorial. A world-famous Scientist for splitting the atom. he had lived in these parts durian his early days. 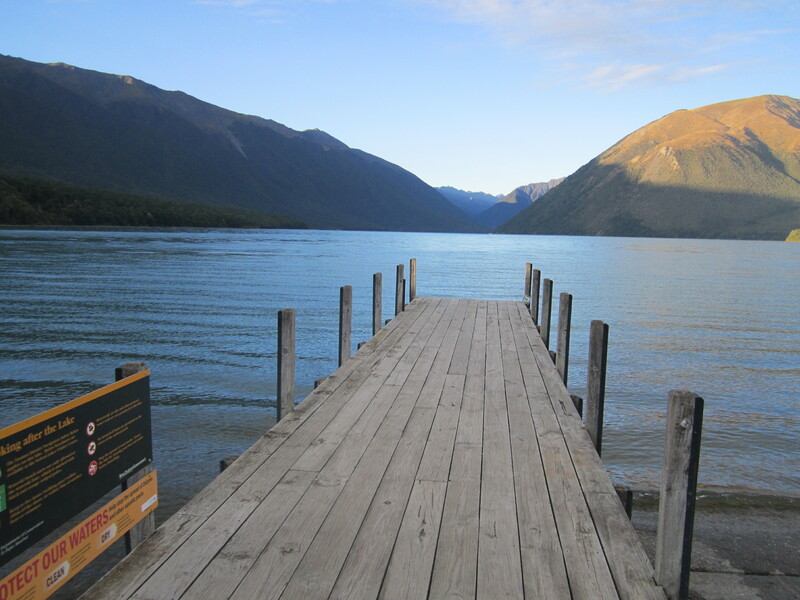 40km up the road I left the main highway for the quieter 63 road which took me up to Lake Rotoiti. It started off flat which was good. It then got very steep. The weather changed and it became very cold. I got up to 600 meters only to go down and have to climb again. 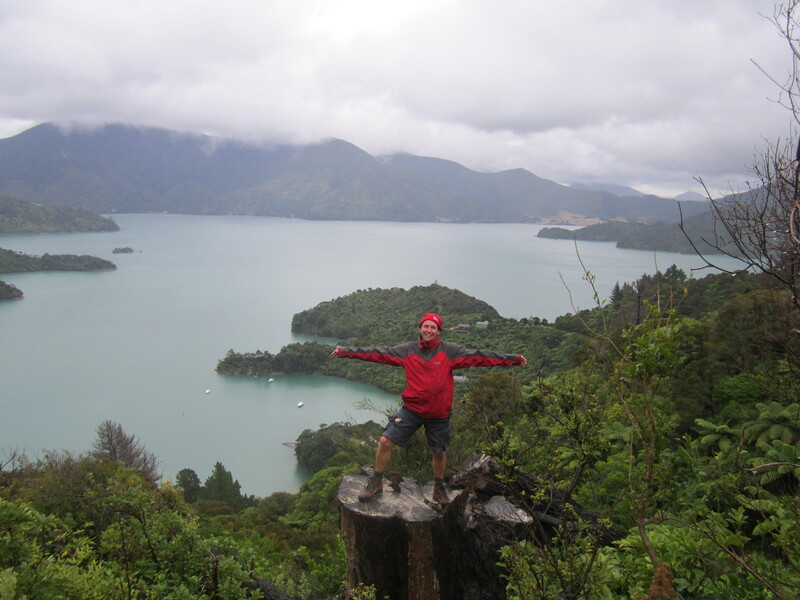 The climbing was worth it because the 2nd time I dropped down in to Lake Rotoiti which was absolutely stunning, even tho all the surrounding mountains were covered in cloud. It had a real alpine feel. Rainbow ski field is just up the road. I camped in the Doc campsite right on the lake The hot shower was welcomed after such a cold day and so was a nice hot meal that I cooked up in the camp kitchen. After dinner I sat down by the lake and watched the sun set. It was a cold but clear morning with the cloud from the day before gone the mountains were now in clear and full view. I was very happy for the first 30km this morning it was a nice gradual down hill with little cycling required down a big wide open vally.eventuilly I got back on the 6 highway which followed the upper Buller river through Murchison. Well known for its devastating 1929 earthquake. The road followed the route of the river and was very up and down. I eventually arrived Lyell Doc camp which was once the site of an old gold mining town. The town long gone and replaced by a grassy meadow. I set my tent somewhere along the old main street in the nice afternoon sun. I was soon joined by another cyclist from America who was heading the other way. Their were some walks around and I took one of the old mining tracks up the valley through native bush to the site of one of the old battery used to crush the rock. When I got back another cyclist from Holland had arrived . so there was a little gang of us this evening. Yesterdays sunny afternoon was swapped with a very misty morning. I got up at 7am. The mornings are staying darker longer. Started with a climb up out of the cloud and into the sun. I quickly stopped at the old Gold field cemetery before continuing. 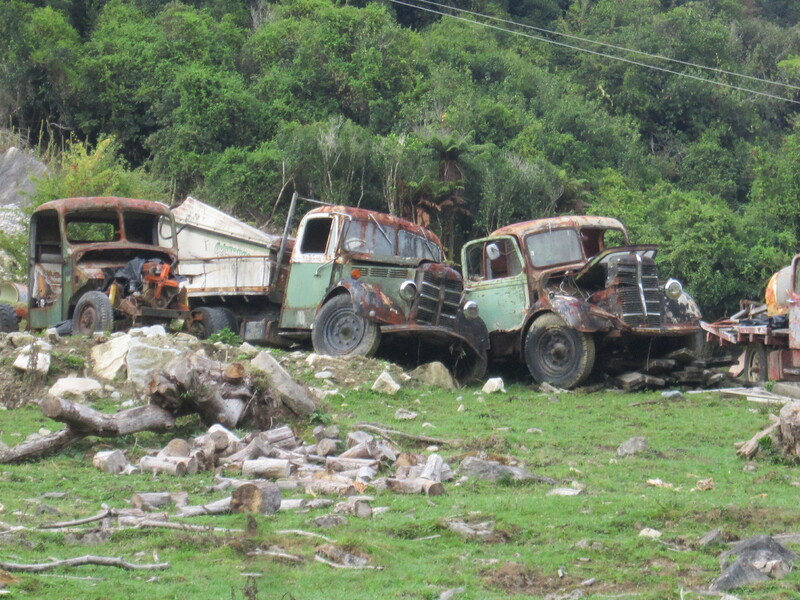 Shortly after passing through Inangahua. Renee the Dutchmen caught up with me. So we cycled together for a few hours through the very nice lower Buller gorge. parts of the road were very narrow. in some parts the cliff over hung the road. It was mostly down, but there was still some up parts. At the junction I turned right for Punakaiki. At Charleston there was an old Gold mine on the side of the road and with a torch I went for a little look inside. Didn’t go to far as it kept branching off in different directions. Inside were some glow worms which looked good. 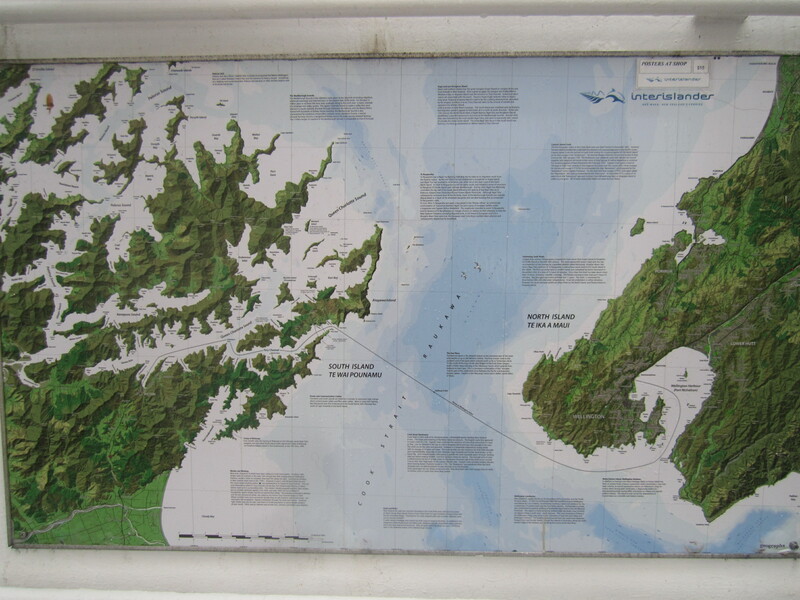 At Charleston I got a first look at the west coast and the Tasman Sea. The Coast was looking beautiful and unspoilt. with just the odd batch scattered among the native bush. 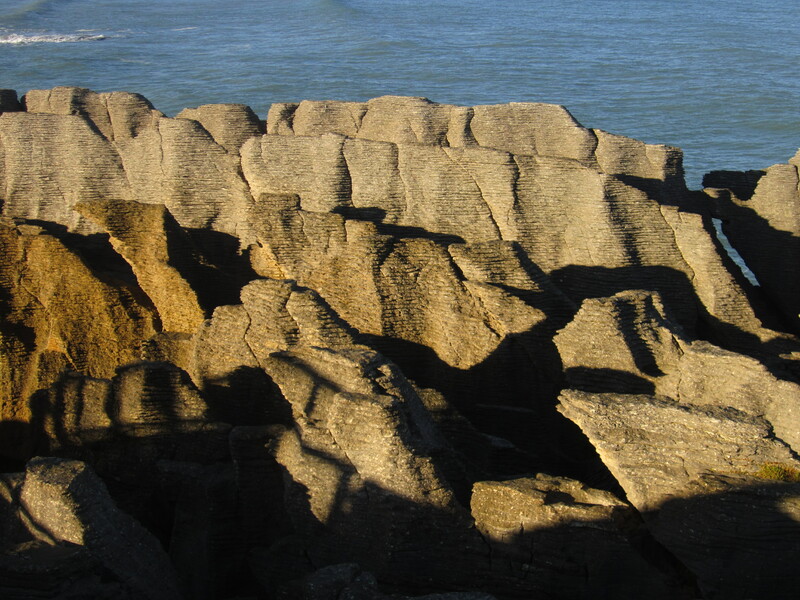 The coast line was rugged with out crops of large rocks out from the shore. 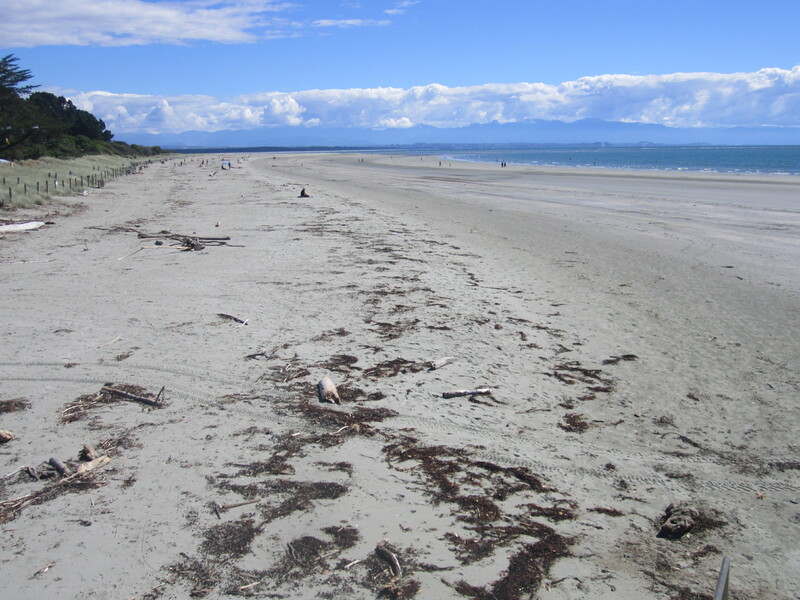 Long stretches of the beach was wide and sandy. 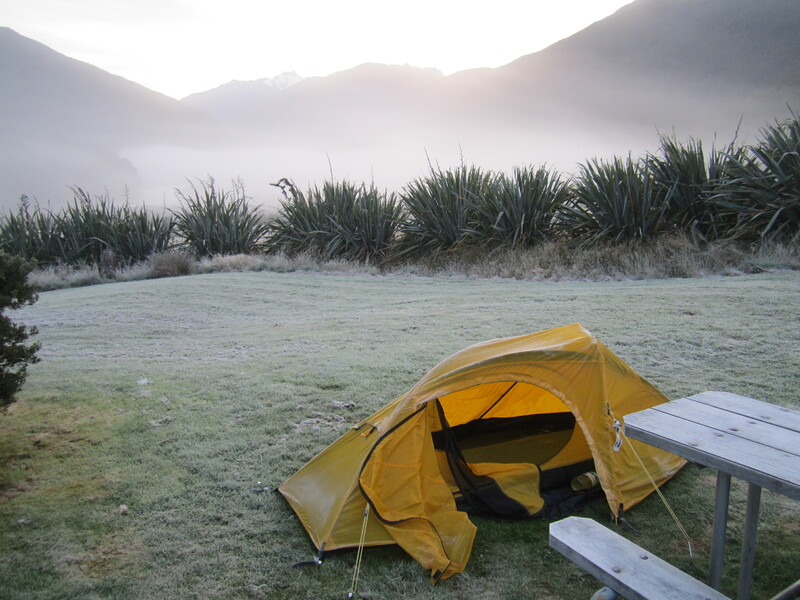 I got in to Punakaiki around 6pm and settled for the $16 a night camp ground. 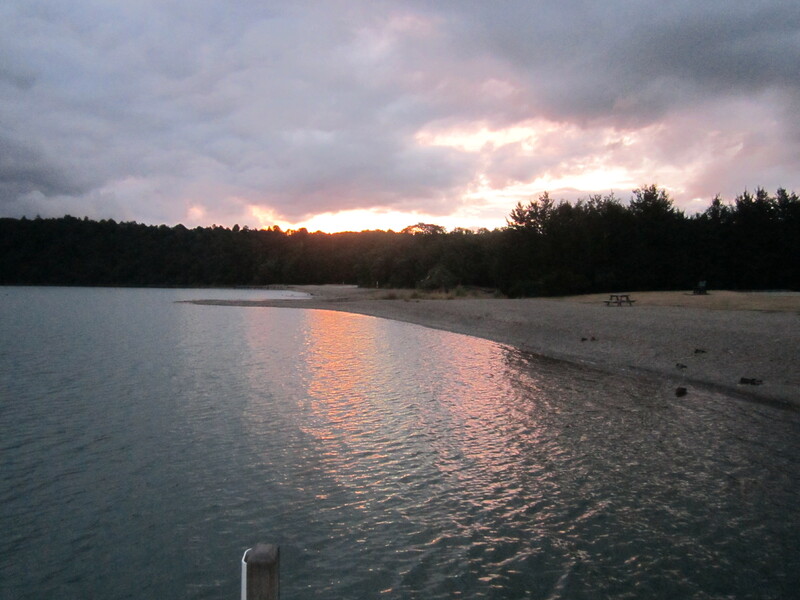 it was right on the beach and after dinner i went down to watch the sun set. Within 1km from the camp site I stopped and looked at the impressive Pancake rocks and blow holes I was lucky to have a nice clear morning. I stayed on the coast. But it was still very up and down some steep hills. 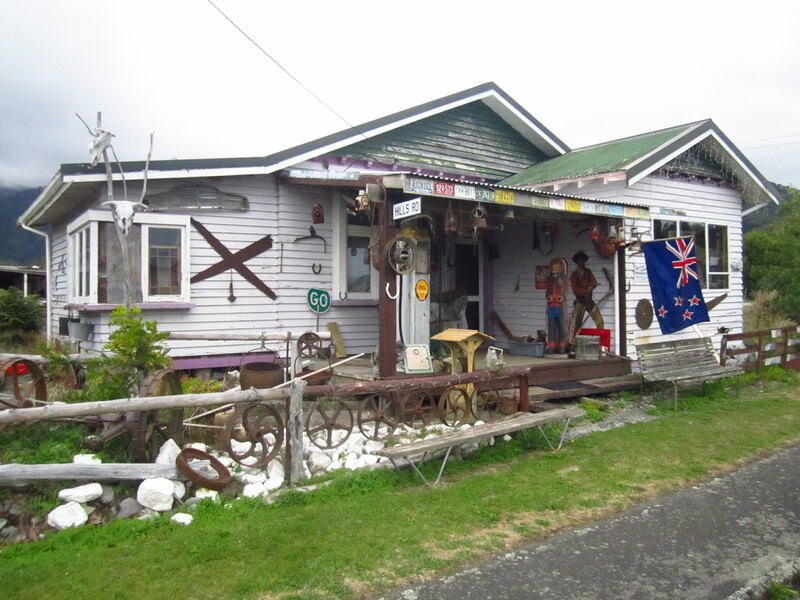 I got to Greymouth after lunch. had a quick look before pushing on for Hokitika. I used warm showers tonight and was kindly hosted by Kevin. shortly after I arrived I shot of in a hurry to get to the supper market before it closed for Easter. Couldn’t afford to miss it with 450km to the next large supermarket in Wanaka. I pushed off from Kevin around 9am. 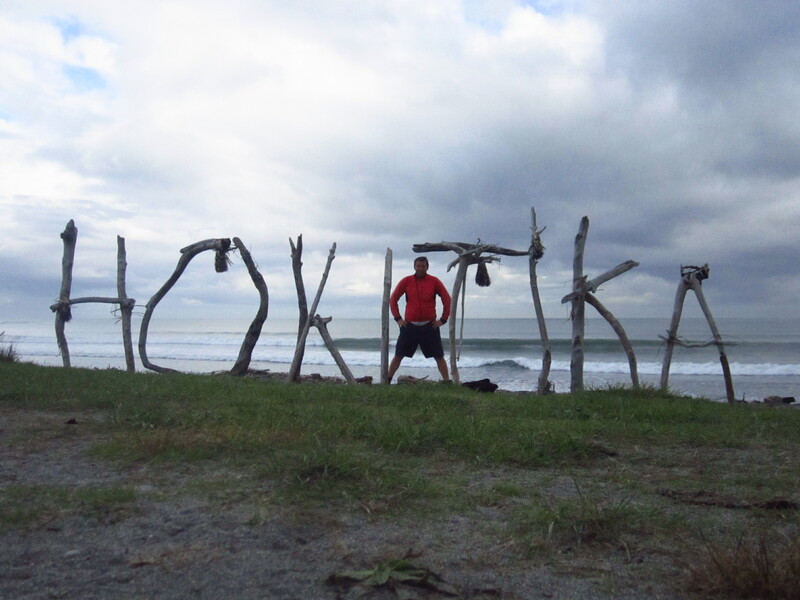 But I didn’t get far because spent the next 3 hours having a look around Hoitika. checking out the foreshore, the free WiFi at the library that they had kindly left on. I finished with a feed of Fish and Chips before I cycled out-of-town and in to light rain. 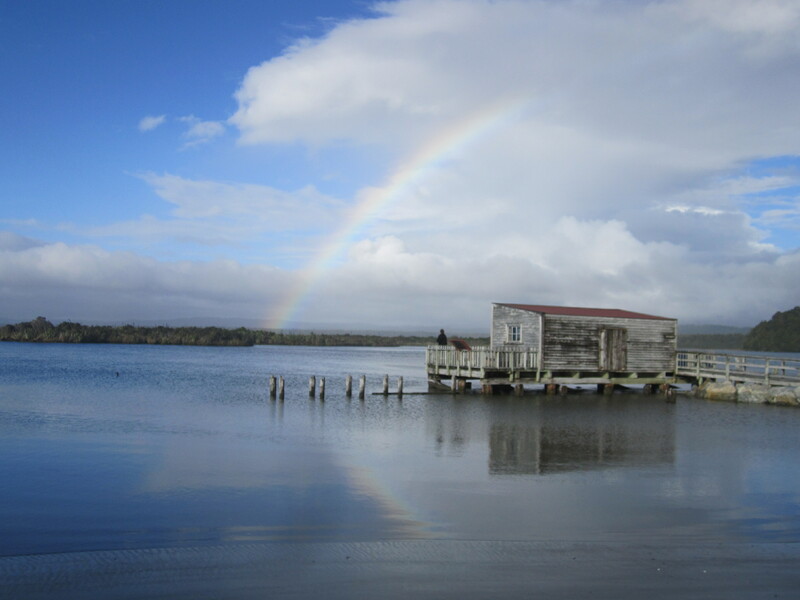 Then 10km down the road bright sunshine was out when I stopped at Lake Mahinapua. In its heyday 100 years ago it was a scene of 100’s of paddle steamers and pleasure boats. On display was an old paddle steamer. I was tempted to stop here for the night. But to make tomorrow an easier day i pushed on to Ross. 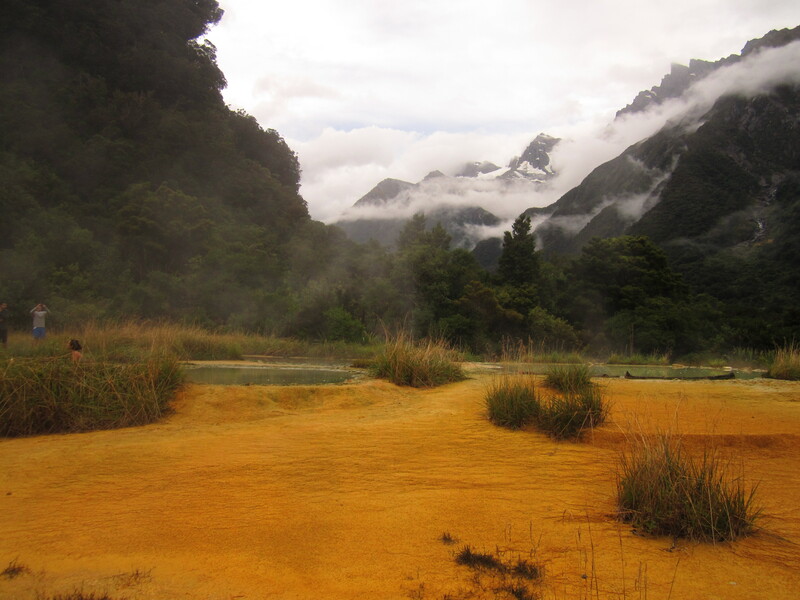 The gold field where New Zealand’s largest ever gold nugget was found. 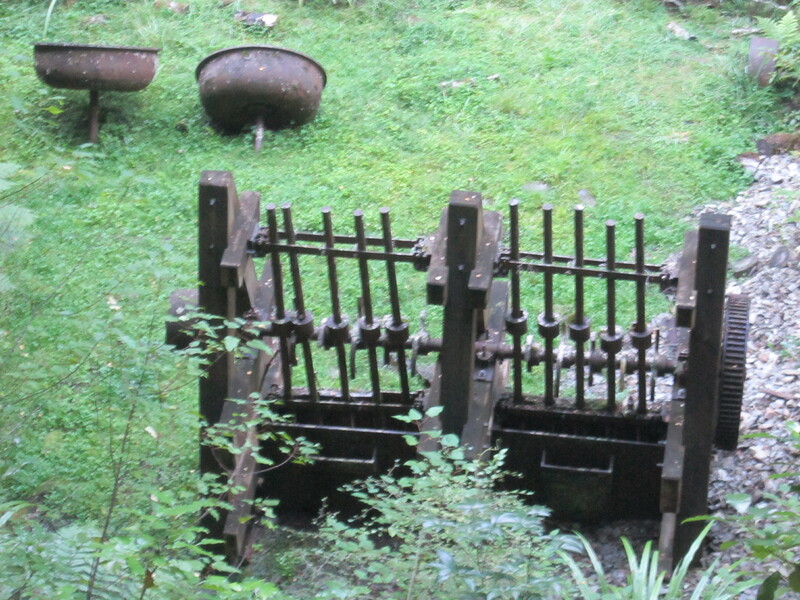 I went on a 1 hour loop tour through the bush exploring old mine tunnels, cemeteries and the water race which were channel used to move water around the hills to the different mines. When I got back I again thought about checking into the camp site. But after only 30km I pushed on. This time the rain got a bit more heavy and I got a bit more wetter. It was nice cycling through all the native bush. 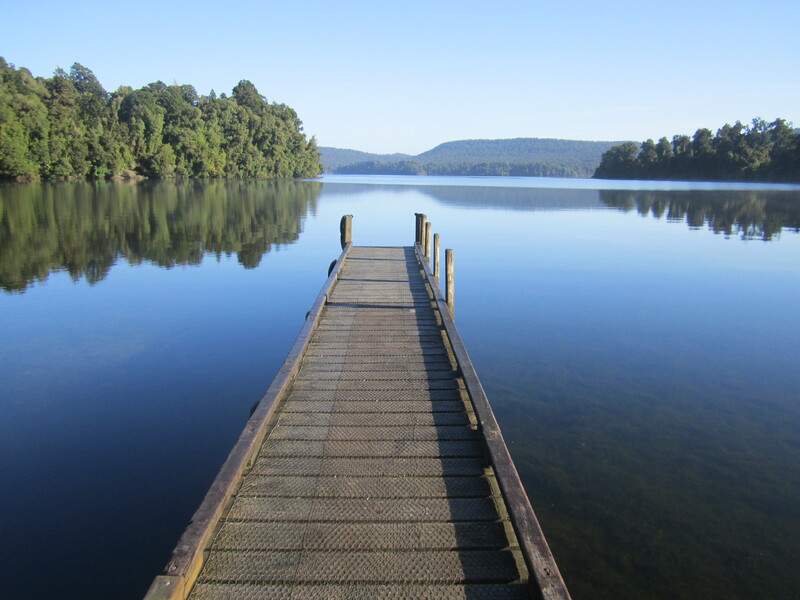 About 6pm I came to lake Ianthe and the DOC camp. All ready a few tents were up and a few camper vans were parked up. I got the tent straight up. Put on some dry cloths. The rain eased and I cooked some dinner. An Aussie couple were camping next door and they joined me at my picnic table I was using to prop up my bike. They had some whiskey. So we sipped that and chatted into the night. In the bank next to the tent were some glow worms. Which was pretty cool. It rained most of the night…….but was clear when I got up at 7am. the moon was out and the lake was dead flat. 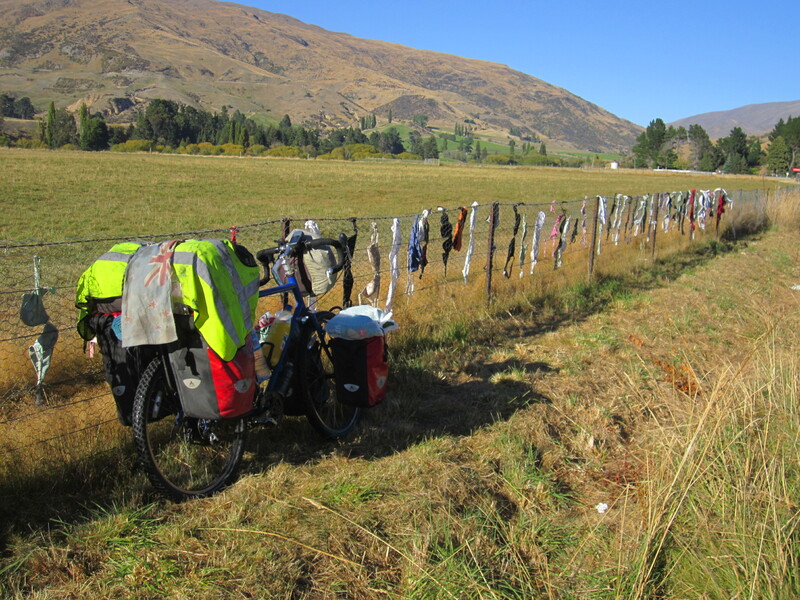 After a cup of tea with mark and Jenny I got away around 9am…….I got a whole 10 meters when my back rack came apart and embarrassingly found all mt back panniers and luggage lying on the ground. I hadn’t tighten up the rack properly after losing it to be able to get it in Regulars car back in Picton. After that false start I was on my way again. 15km I stopped at Harihari for some breakfast with some long bearded bikes from Christchurch out for the weekend on their Harley Davidson. 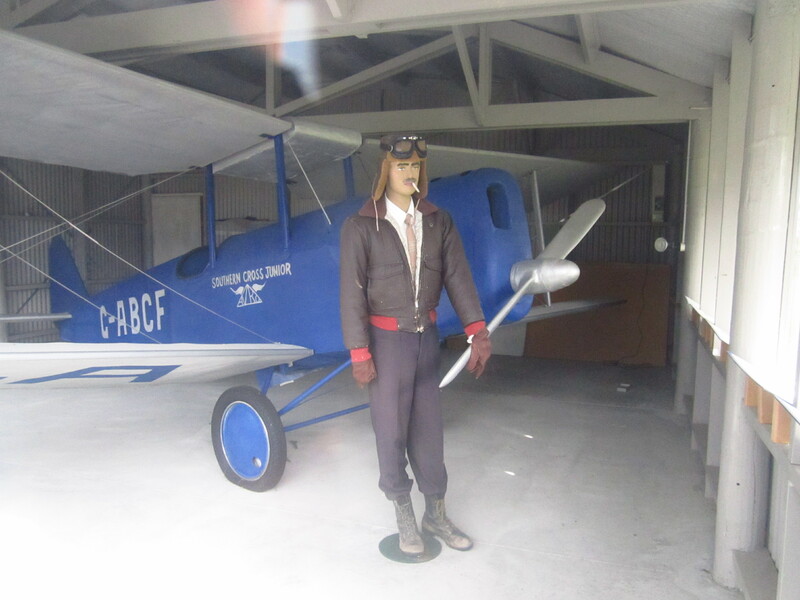 In Harihari is a replicate of a plane that was used for the first solo flight between Australia and New Zealand by Menzies back in 1931. He landed in a swamp and flipped it on its nose. I took a slight D tour in the afternoon cycling the 13 km off the main road and down to Okarito beach which has a very beautiful lagoon . 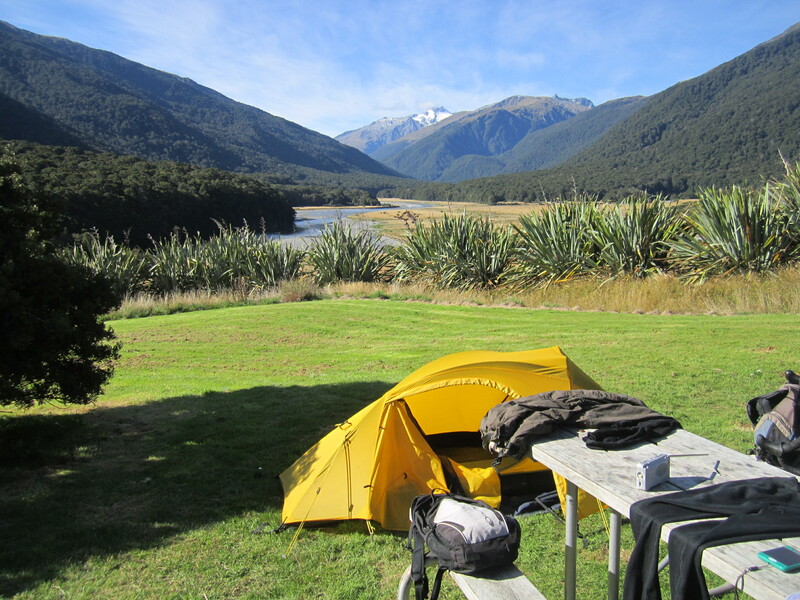 just a few houses and a camping ground for $10 a night. It rained a lot in the night. It stopped slightly when I got up at 7am and i went and sat in the kitchen. I had big plans for today…….but they were put on hold and it was just as well I was staying put because there was some torrential rain. which didn’t let up. I was getting a little worried as I was watching the puddles form around the tent.The morning was a right with the weather been so bad. ended up playing some more cards. Late morning it eased a little and just when I was ready to head out for a walk it would start to rain again. Finally at 2pm blue sky appeared giving confidence to venture out. I went on a 3 hour walk through the bush on an old mining road down to 3 mile Lagoon. Plenty of singing birds around. With the tide up you could hear the waves crashing against the cliffs. For the trip back i was hoping to walk back along the beach. But the tide was to high. Instead i ended up walking up to the Trig look out. 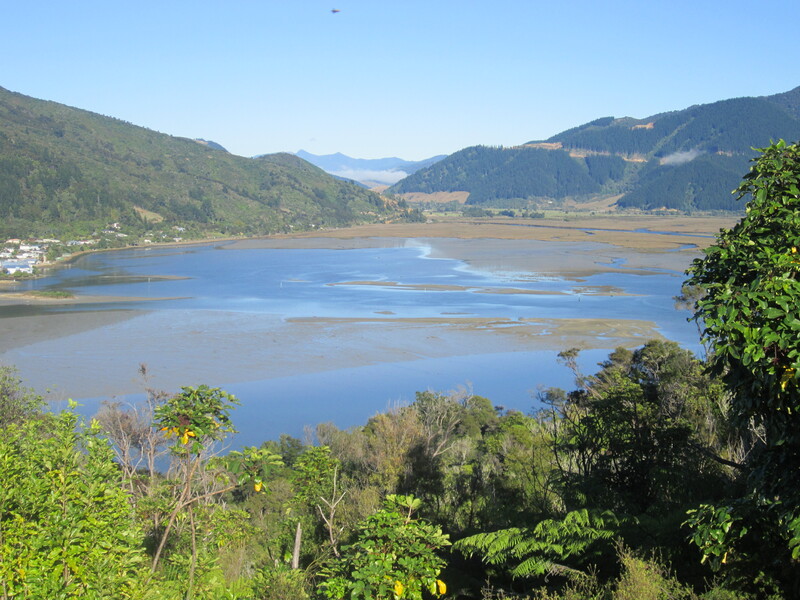 From here you could see the ocean and both the Lagoons of Okarito and 3 mile. Afterwards I made the short walk down to the old wharf and a closer look at the Lagoon. The water was flowing out at a quick rate of knots with the tide. The camp site is a lot quieter tonight with not many campers about. During the night there was torrential wind and rain. It was so loud as it hit the tent. I couldn’t sleep.But when I emerged from the tent all the cloud had lifted and the snow-covered mountains and Mt Cook could be clearly seen. It was a crisp morning as I firstly cycled the 10km back up the hills to the main road. With the rain the rivers and streams were running fast. 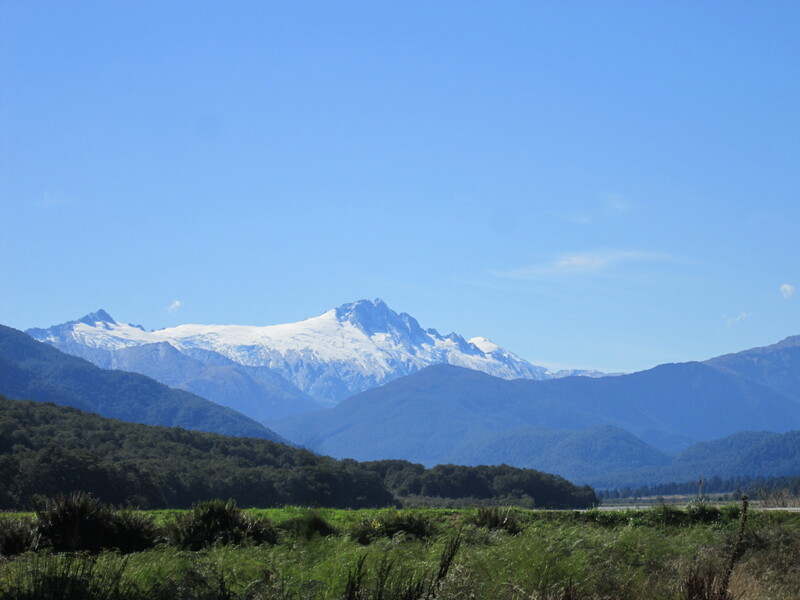 From the main road the snow cap mountains could be seen as we got closer and closer to Franz Josef Glacier. Cycling into Franz i got the impression straight away that it was an expensive looking tourist town……..and it was. with its up market Coffee shops and travel agency’s. I went straight to the Doc office and booked a campsite for tomorrow night. 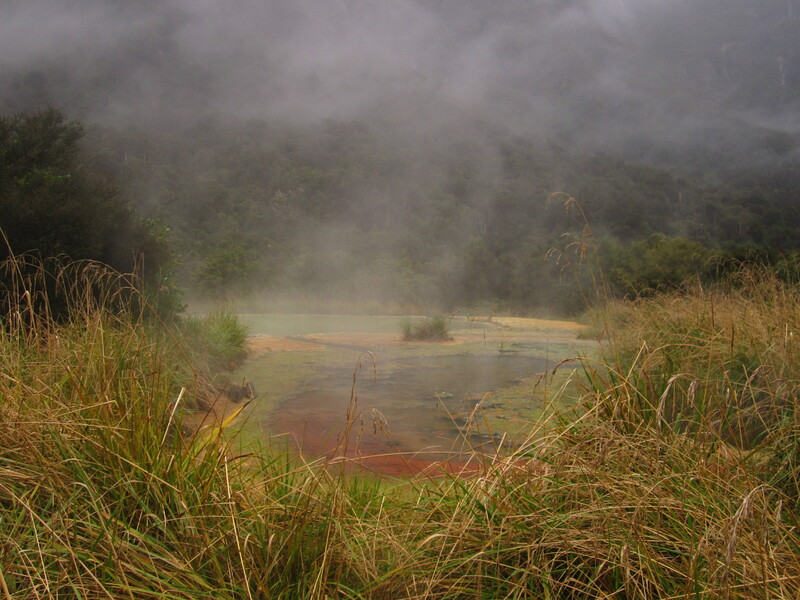 I am going to leave my bike in the bush and walk the Copeland track 6 hours up to Welcome flat hot pools. I was going to stay in Franz but when the Backpackers told me I wouldn’t be able to cheek in till 2pm and I couldn’t even put up my tent. I walk. Well I ended up cycling straight up to the Franz Josef car park. There I left my bike and walked the 90 minute returned track up the valley to the glacier viewing point. On the way we passed an ice cave or arch. you could see it melting. So you know it wont be around for ever. Today is the two-year anniversary since I first set out from London back in 2011. Seams like such a long time ago and so much has happened. The South I|sland is really starting to get cold durian the night and the morning are pretty cold as well. Its staying darker longer as well. Winter is on the way. I had a bit of a different day. 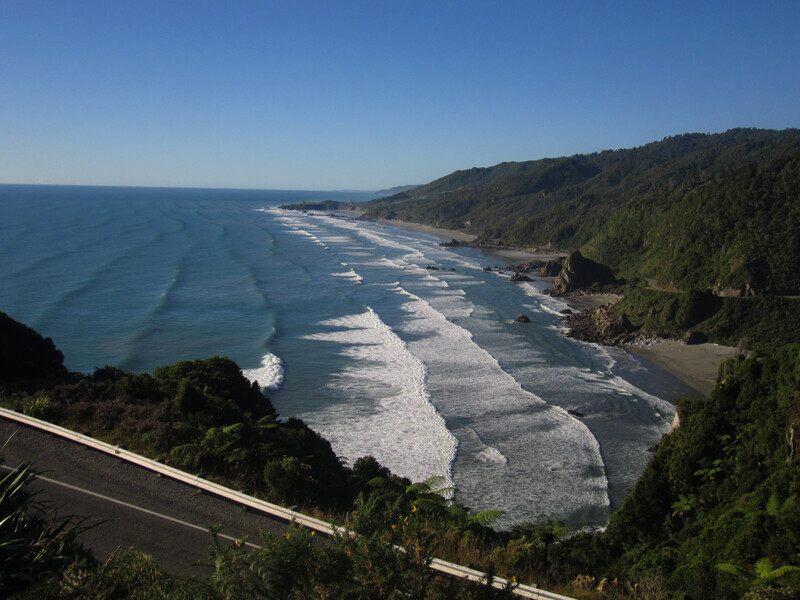 I only had to cycled 27km to the start of the Copeland track. Here I left my bike in the car park padlocked to a post. 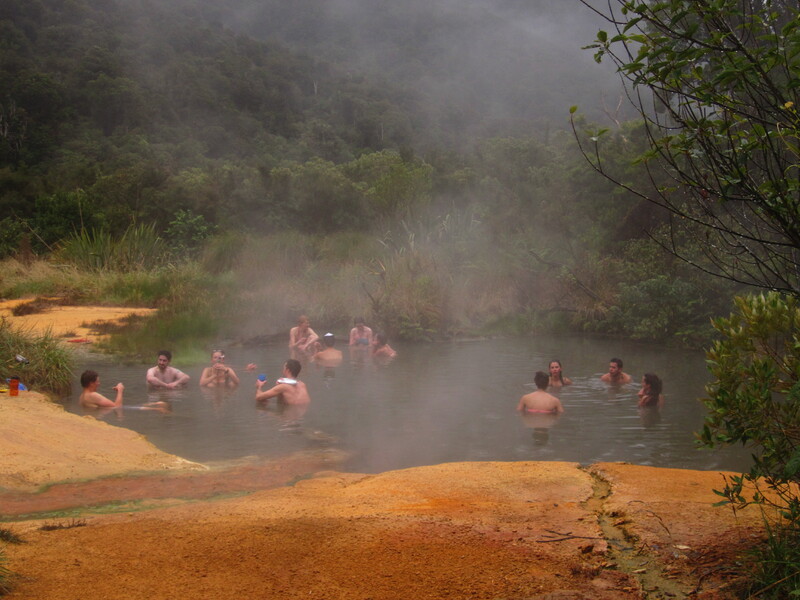 I then only took what I needed to tramp in the 18km to the Welcome flat hot pools and hut. Tent, gas cooker, pots and pans, food, sleeping bag , roll mats and warm cloths. The less the better since I will have to be carrying it. It will be one day in and one day out. Your feet don’t stay dry for long. Straight away you get wet feet when you have to cross the first river. It’s then a tough walk crossing many little streams, climbing over rocks. crossing land slides. 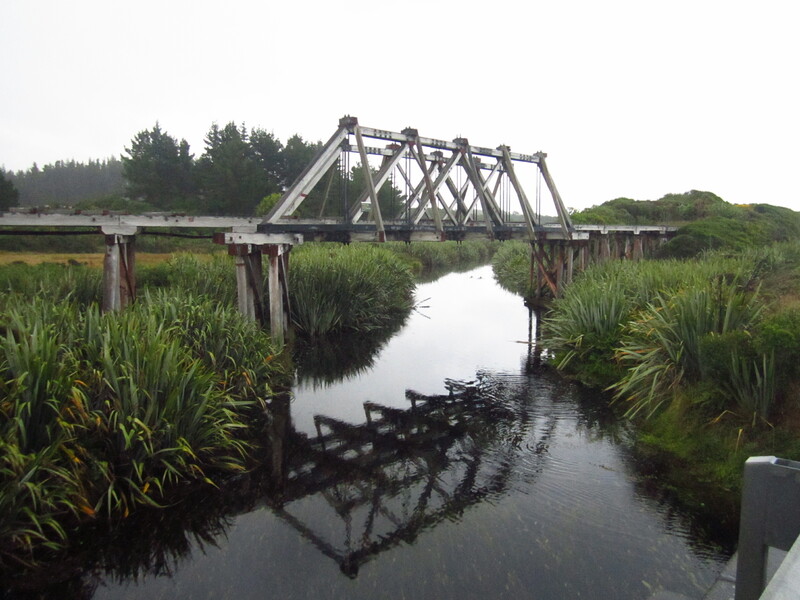 In two parts there are some swing bridges 100 meters long and hanging high over a stream. You wouldn’t want to be scared of heights. I made good time completing the 7 hour hike in 4 1/2 hours. I guess the hot pools were a good incentive. The last few km it started to rain. When I arrived the first priority was to get the tent up. 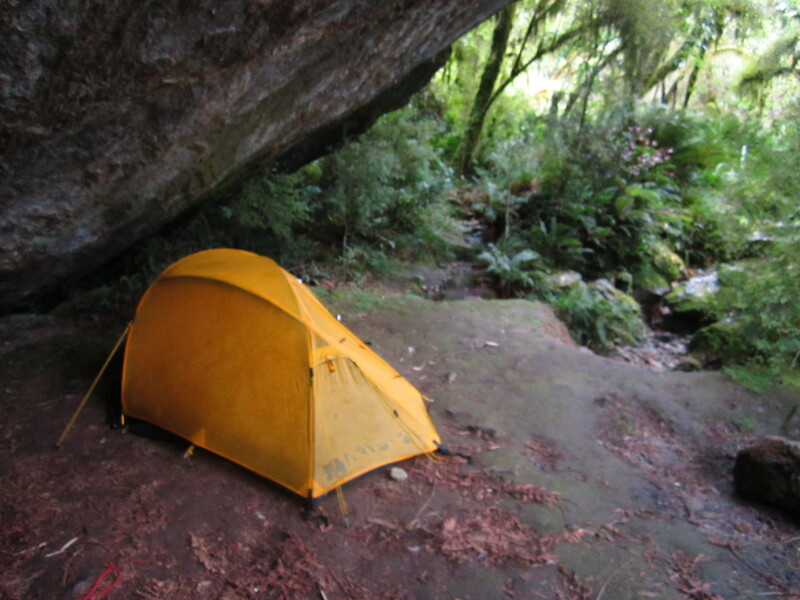 The lady at the Doc office had suggested putting my tent up under the huge rock. So i did just that and it worked well. 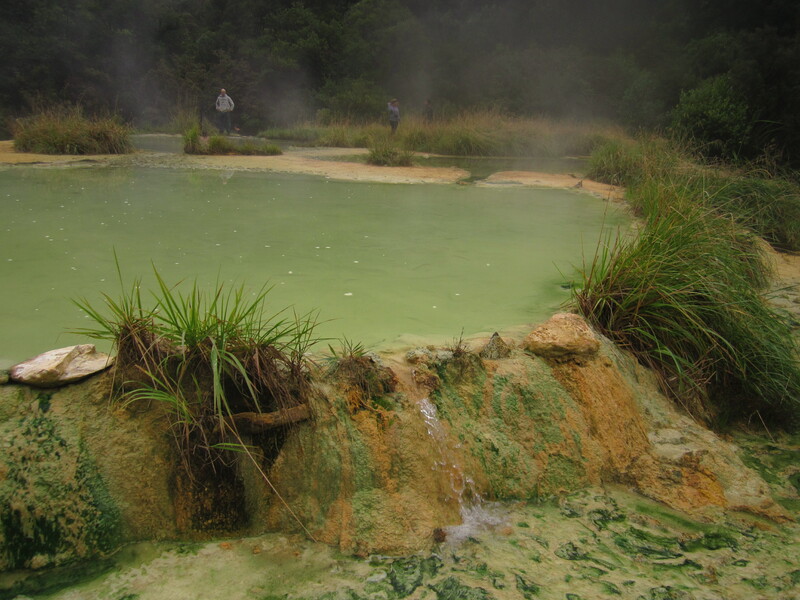 Then it was straight in to the hot pools Which are absolutely stunning. 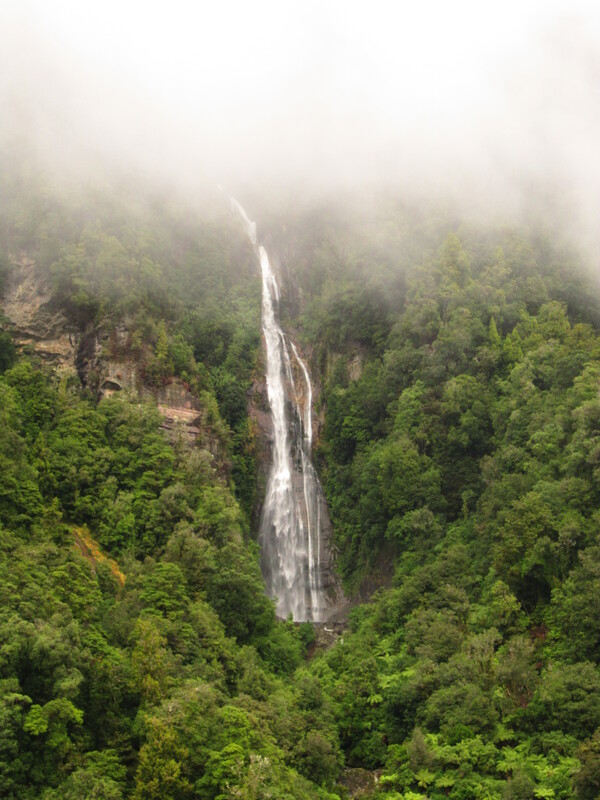 In the middle of nowhere with steam rising from the pools surrounded with snow caped mountains and waterfalls and native bush.
. You had to bring your own gas stove to cook. Was staving after the hike and I cooked up a big portion of rice with a tin of stew. 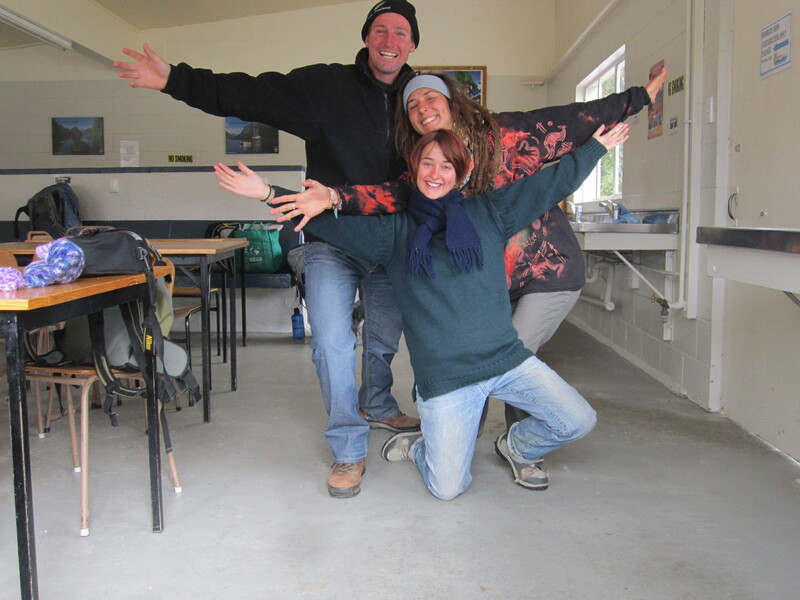 Nice to see the group I meet at Okarito again. I joined them for some Cheese cake and with candle light we in the hut spent the evening chatting till about 9:30pm when i went back in the hot pool for a quick dip before bed. 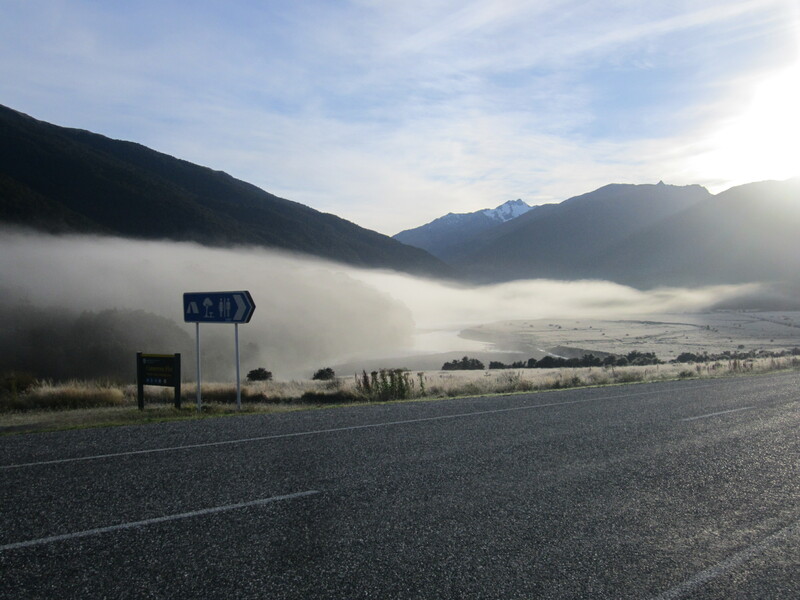 There was a severe weather warning issued for 100 – 120 mm of rain and the day before it was said that only experienced trampers should enter the valley . This mornings advisory from the hut warden was that people should leave around lunch time. So as to give the rivers and streams a chance to go down.Dispite the storm over night. From under my rock I was able to stay very dry and was well sheltered from the wind. 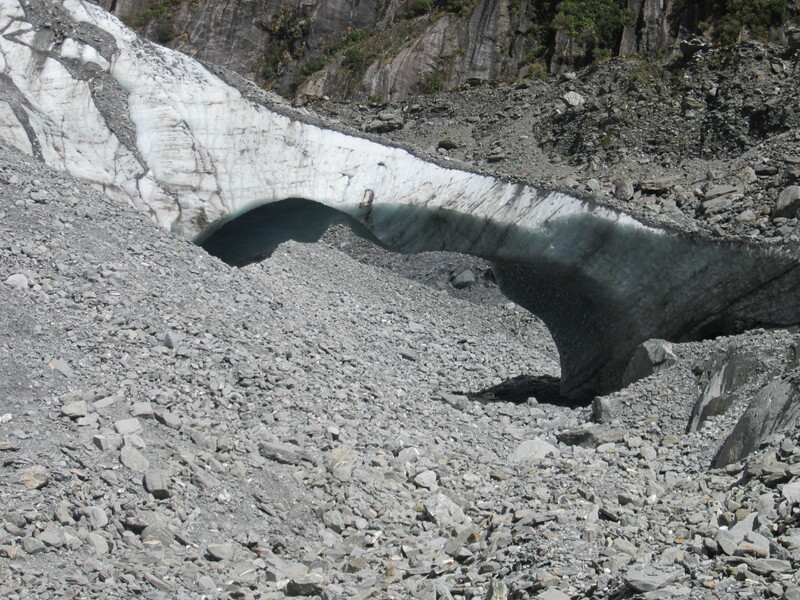 The morning started to clear quite well and the glacier became visible. Even with the warning a lot of people headed off early. I pack up and then jumped back in the hot pool and relaxed for a couple of hours. About 10:30am I made the decision to head off. There was a lot of water about with all the little creeks and streams flowing. There were so many beautiful waterfalls . It was clearing. in the afternoon the rain returned. When I got back to the car park everything was wet. The sun came out which was nice. I hung out everything to dry as best it could. A few other people were doing the same. But eventually they all left and I put up my tent for the night. When the sun went down it became very cold. I had some guys come and camp next to me. They had camera equipment and were trying to film Dear in the wild for a DVD they were making. No fun putting on wet shoes and socks. that just hadn’t dried from yesterday. It was blimin cold as well. I got back on state highway 6 and continued to head south. Early morning there was little traffic and I had the roads to my self. Most of the West Coast bridges are all single lane suspension bridges. In 98KM their were no shops along the way. The road carved through a very wild-looking rain forest. 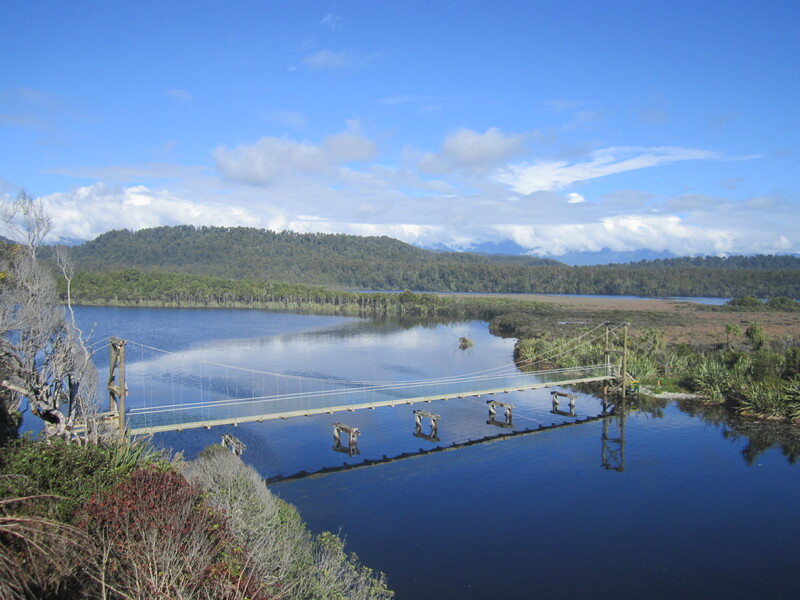 After 50km I stopped at lake Paringa and had some lunch on the water’s edge. After lunch the road was a bit more steeper. we came out on the coast. the sea was looking wild as well. I got to Hasst at 5pm. I gave myself a day off in a town where there is really nothing to do. But this didn’t bother me because I was quite happy just crawl up on the couch in the lounge and watch a bit of TV. it rained later in the day which added in favor of the decision to stay. 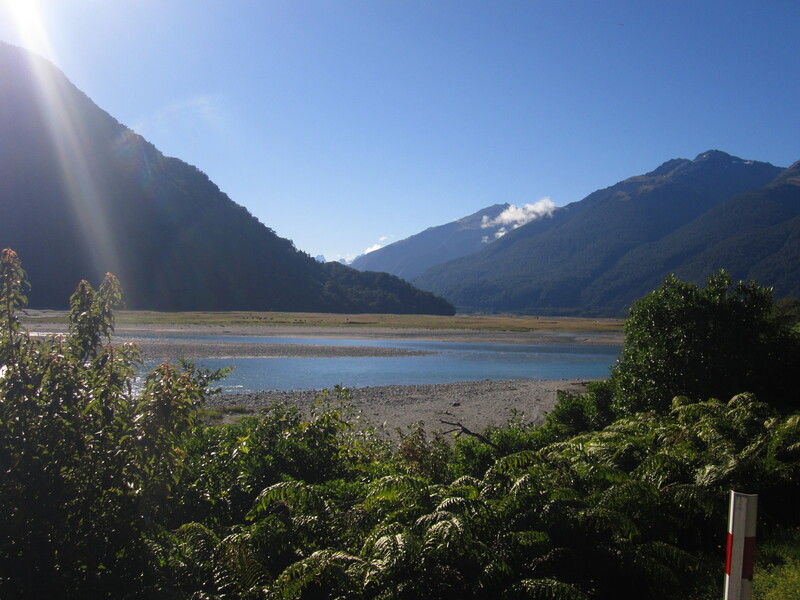 By going over the Haast pass and crossing the Southern Alps I Will be leaving the west Coast . It was a very chilly morning as I cycled and it wasn’t helped because the sun was well hidden by the mountains. I was thankfully for the new woollen hat and gloves i brought in Hokatika knowing these cold days were coming. It was a kind pass with the first 30km been very gradual. 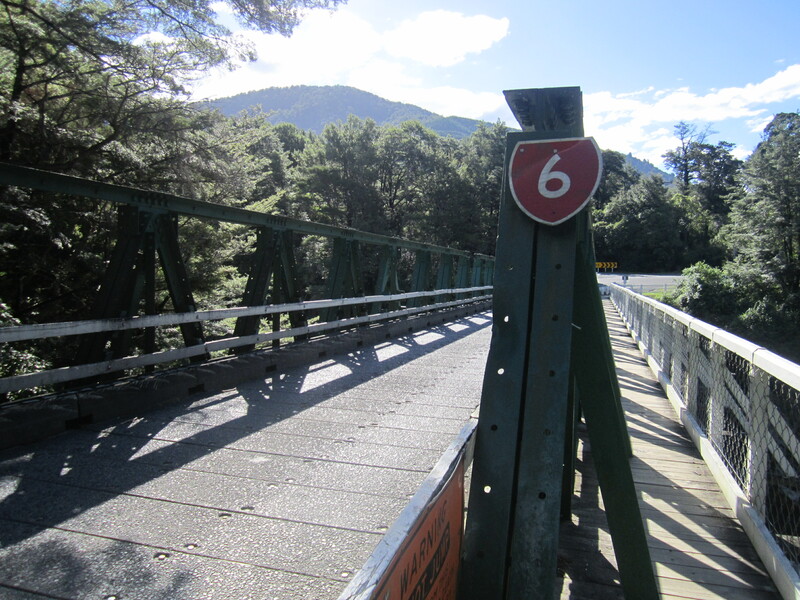 At the junction between the Haast and ? rivers you got an awesome view back up the opposite valley with the glacier in full view and the sun now shining on it. I stopped at pleasant Flat to enjoy the view, some lunch and a sleep before tackling the pass. Thunder falls was only a short walk from the road and worth a look. The whole pass was lined with many fast flowing water falls. When i got to the steep part it was steep and tough. But the good thing was the steep part wasn’t to long. At 562 meters I reached the highest point of the pass and I then coasted down the other side. I got to Cameron flats a lovely sun spot around 3:30pm. looking back towards where I had just come. 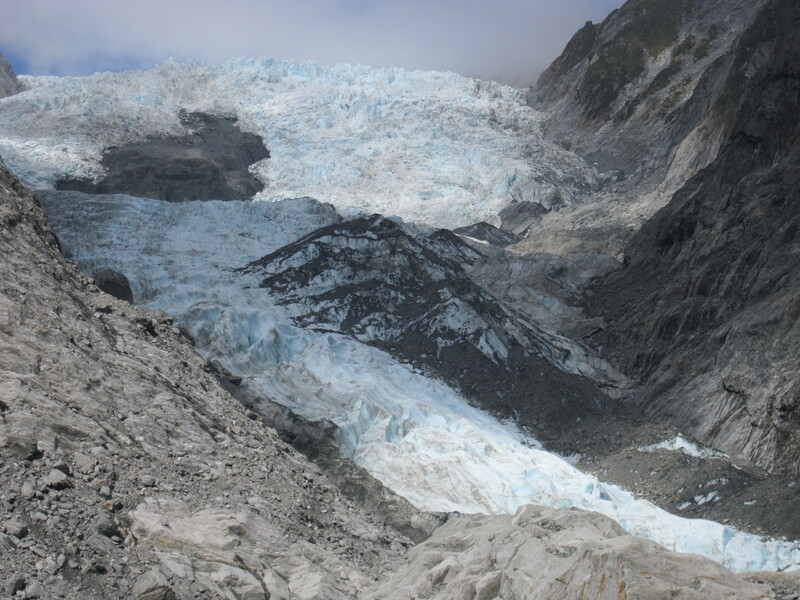 There was another nice glacier in full view. With the sun on it. It gave it that little edge. There was a nice grassy area on a little hill to put the tent up on. As the sun went down it started to get really cold. By the time I had cooked my dinner and finished talking to some Aussie tourists in a camp a van. I was freezing when I got in the tent. It reminded me of the cold days in China. I went to bed fully clothed. Not use to these cold nights or cold mornings. The tent iced up over night. and there was a bit of a white frost. At least with a frost you know you will be getting a nice sunny day. The clocks changed over night and leaving at 8am wasn’t to bad with the clocks going back. Once I reached Lake Wanaka it was a stunning ride along the lakes edge . Even better was the 500 meter cross over to Lake Hawea. This is truly a beautiful lake with sharp rugged mountains in the back ground. On the road side was some nice green pastures with cattle and Bison grazing. When I got in to Wanaka I went straight to the expensive supermarket to restock before walking along the lake front on the way up to the $18 camp site. That treated me to a nice lunch they cooked up in the camp kitchen. After lunch we went for a hike up to Mt iron for some panoramic views of Wanaka. Afterwards we stopped for coffee in puzzle world and were kept entertained by the puzzles. The girls are doing things on the cheep and I helped them find a good camping spot at the foot of the mountain. After a very nice day I said good-bye and headed back to the camp site which I had unfortunately already paid for. otherwise I would have joined them. Another frost this morning. 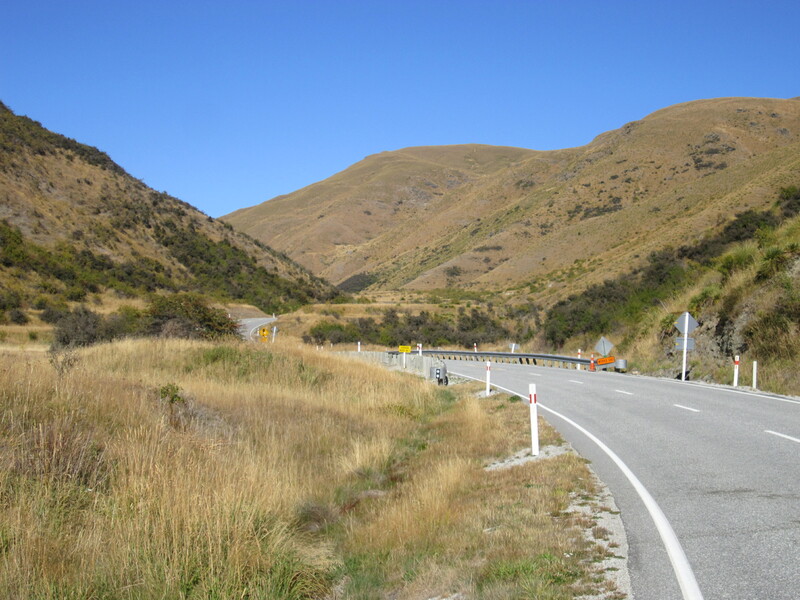 I cycled off in shorts and it was freezing even with the sun out, as I went up the Crown Range Road towards Queenstown The first 35km was very gradual and a real pleasure to cycle. The road was quite and had a real alpine feel to it. following the Cardronia river. Flanked by hills covered with short clumps of tussock grass. The last 5 km was a killer. Having to dig deep to grind up the now steep and windy roads. 25km up the valley. just before Cardrona. There was an unusual sight with 100’s of women’s bras hanging on a farmers fence. Many sizes colour and style. Not be left out, A few guys had started to leave there under pants on the fence as well. 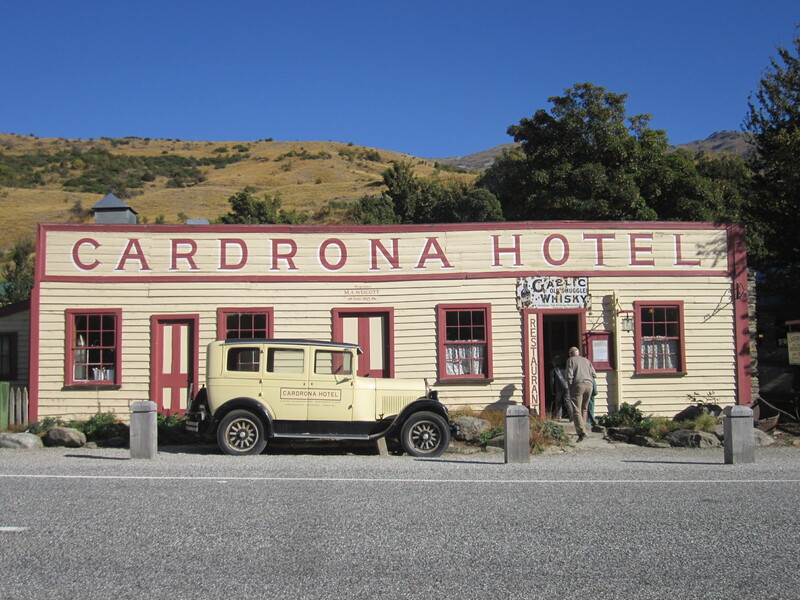 Cardrona itself is a nice little town. I had morning tea on a picnic table in the grounds of the historic school and church. At 1070 meters it was absolutely freezing at the top of the pass. I didn’t hang around to admire the nice view of Lake Wakatipu and the Remarkibles in the back ground. Before I started my sharp decent. Before heading to Queenstown I decided to cheek out Arrowtown first. An old historical town established during the Gold rush of the 18 60’s. 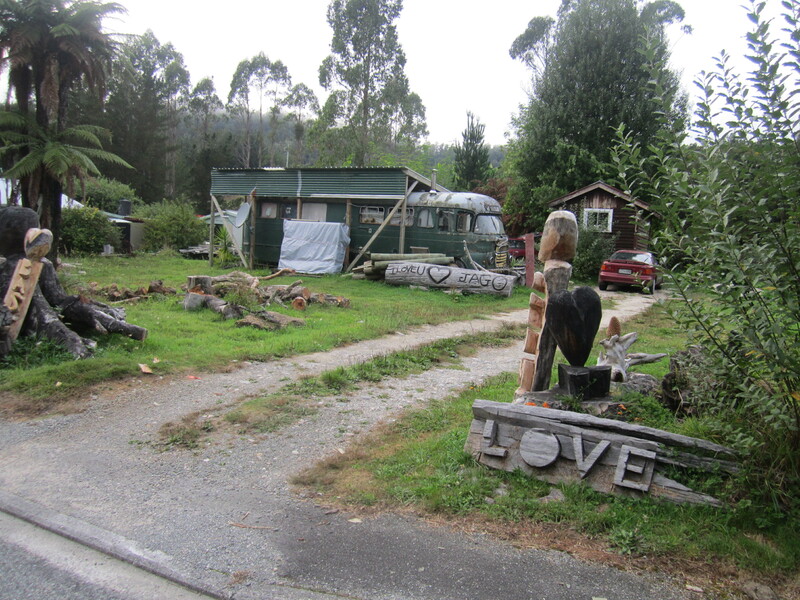 I cheeked into the $18 camp site and then went straight into town for a look. Just one main street with a row of old miners cottages. the old bank, post office and council chambers. 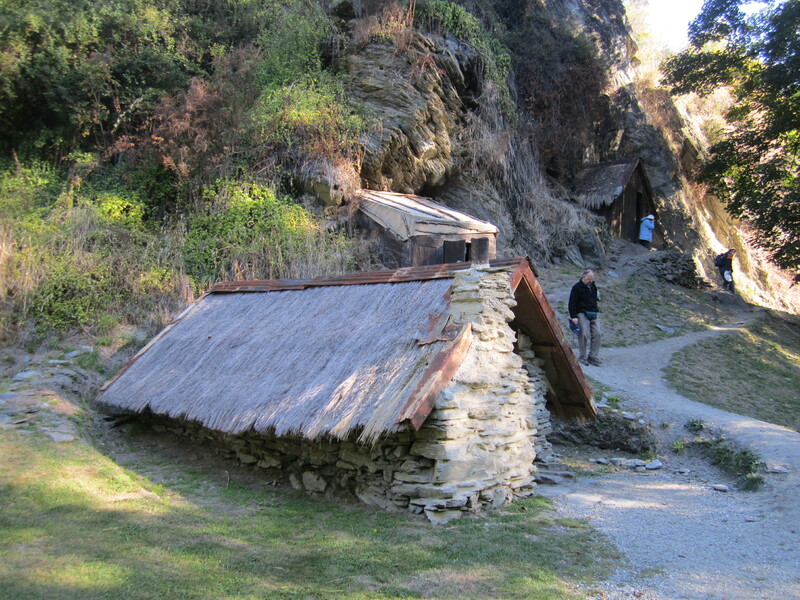 I did the walking tour up to the Chinese village which is where the old chinese miners lived in very primitive huts. The walking tour also went along the river and past the old Gaol and the lovely stone church. 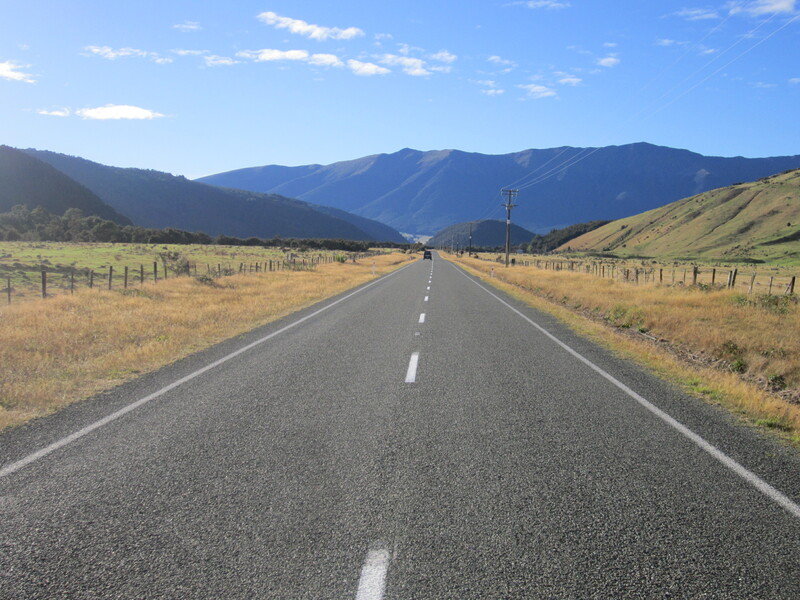 I was told to take the back road to Queenstown and it was very nice. it brought me past the Shotover gorge and i saw the jet boating. cycled over the well known bridge that appears in many photos and brochure. 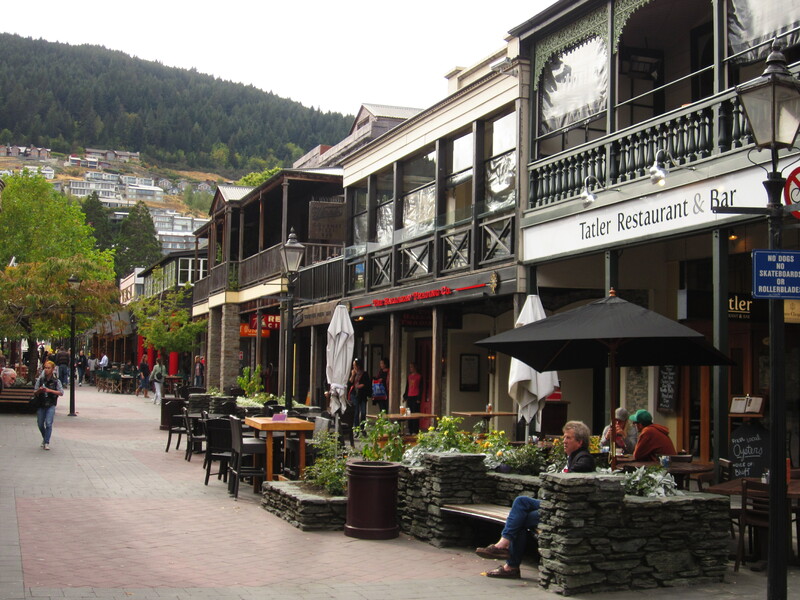 Never been to Queenstown before. I was presently surprised. I think i was lucky it wasn’t to busy. I had a little wander through the main street before making my way down to the waterfront. Not a huge area at all but very nice with the little stoney beach of Lake Wakatipu. The small wharf with the old steam ship and some old buildings to go with it. 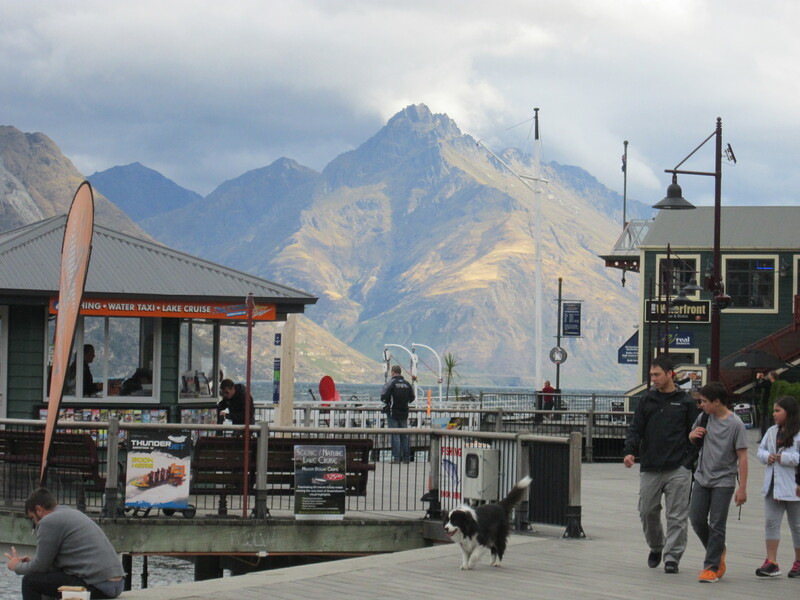 Queenstown and the lake are surrounded by the mountains which makes it very pretty. 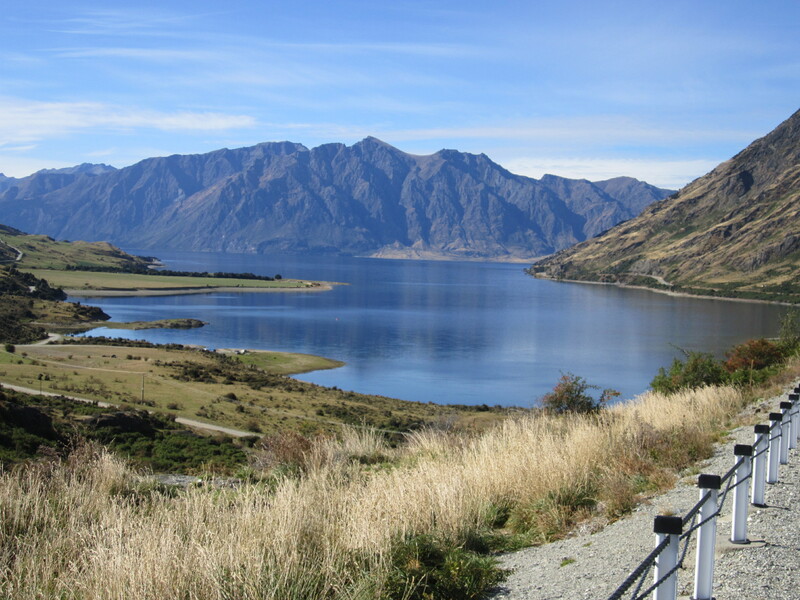 I spent the afternoon in Queenstown before cycling out-of-town and along the lake in the in the direction of Glenorchy.